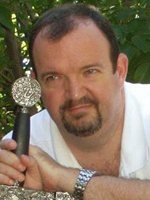 Tracy Hickman is the New York Times best-selling co-author of the Dragonlance, Darksword, Death Gate, Sovereign Stone, and Dragonships series. He's been inducted into the Origins Hall of Fame. Pyramid magazine stated that Tracy Hickman and Margaret Weice are "basically responsible for the entire gaming fiction genre." The Dragonlance series alone has sold over 20 million copies. He and his wife, Laura, also created the classic adventure Ravenloft and the Oasis of the White Palm, as well as the Bronze Canticles series.